Next-Door Discoveries is here to create a fun learning experience for your little ones! 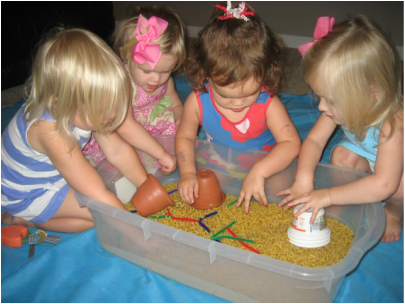 Toddlers and preschoolers are active learners, and at Next-Door Discoveries, they learn by doing hands-on educational activities. Each week, the children learn through a fun and friendly curriculum, which includes Art, Music & Movement, Science, Math, Language & Literacy, Fine Motor, and Gross Motor. A complete list of activities will be sent home every time we meet. Children receive quality one-on-one time with their teacher because of small group sizes, and are able to develop skills that are appropriate for each individual child. It is so much fun to see the kiddos become friends with the other children in their group, and to watch as they learn to engage in and enjoy all of the activities. Next-Door Discoveries is a neighborhood-based business, so the location is collaborative and convenient for you and your child. It is also a GREAT chance for Mom or Dad to get out of the house for a few hours! Our Wednesday friends playing in sensory!